When it comes to your business, your network is the gateway to the world. Unfortunately, protecting your network from evolving threats is more difficult than ever. Device proliferation, BYOD, Internet of Things, virtualization, hybrid cloud adoption—all are crucial trends that enhance business performance. But they also add complexity and increase the attack surface. In addition, DNS, an essential component of network connectivity, has emerged as the number one threat vector for malware command and control, DDoS attacks, and data exfiltration. Even as your network modernizes and gains valuable new capabilities, threats multiply exponentially. The problem is, your security teams are tasked with securing increasingly complex networks using fragmented legacy tools that lack much-needed visibility and are unable to work in unison to address threats effectively. In an ideal world, you could automatically eliminate gaps in your security defenses, improve visibility, protect sensitive data, eliminate silos, detect, prioritize, and remediate security issues faster by understanding threats in context. 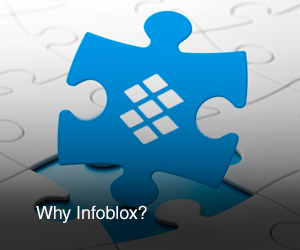 As the leader in Secure, Cloud-Managed Network Services, Infoblox makes that ideal a reality. Infoblox raises network security to a whole new level, enabling you to proactively protect your infrastructure, your data, and your business. In today’s competitive environment, application and service availability are top priorities. You can’t afford to have attackers disrupt your network, or worse, put your business reputation and revenue at risk. With the Infrastructure Protection solution from Infoblox, your organization can gain visibility into the extended infrastructure and maintain application and service availability while defending against the widest range of DNS-based attacks. The solution can also identify unmanaged and non-compliant network elements and automatically notify security tools such as a security Information and event management (SIEM) and Network Access Control (NAC) of threats and associated context in near real-time. DNS is the leading attack pathway on your network. For example, more than 90% of malware exploits DNS at various stages of the cyber kill chain to penetrate networks, infect devices, propagate laterally, and exfiltrate data. With the Infoblox Data Protection and Malware Mitigation solution, your organization can secure DNS to stop the spread of malware, ransomware, and data exfiltration by leveraging advanced signatures, threat intelligence, and unique behavioral analytics. The solution enables you to remediate threats faster by harnessing curated threat intelligence and automatically alerting internal and third-party cybersecurity ecosystem components in real time when device activity reveals the presence of indicators of compromise. With Infoblox, you can protect your users, devices, and data wherever they are: on-premises, roaming, in remote offices or branch locations. One of the biggest challenges your security teams face is the flood of threat information they must process every day. Prioritizing threats and determining the ideal remediation path are key to rapid resolution. The Infoblox Threat Containment and Operations solution takes the guesswork out of network security by enabling you to: optimize siloed threat data with consolidated threat intelligence; prioritize threats using network context; and triage response. The solution automates orchestration to incidents by seamlessly integrating with your existing security infrastructure and expedites remediation by sharing curated threat intelligence across your security ecosystem.